Although some cigars are cut on both ends, or twirled at both ends, the vast majority come with one straight cut end and one end in a “cap”. Most quality handmade cigars, regardless of shape, will have a cap which is one or more small pieces of a wrapper pasted on to one end of the cigar with either a natural tobacco paste or with a mixture of flour and water. 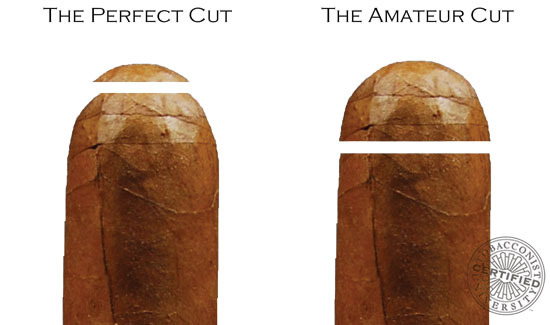 The cap end of a cigar must be cut off for the cigar to be smoked properly. It is the rounded end without the tobacco exposed, and this is the end one should always cut. If the cap is cut jaggedly or without care, the end of the cigar will not burn evenly and smokeable tobacco will be lost. Some cigar manufacturers purposely place different types of tobacco from one end to the other to give the cigar smokers a variety of tastes, body and strength from start to finish.